Ms. Mitsuk has over 19 years of work experience in an administrative and office management role, with a strong emphasis on information management and financial administration. She worked for 8 years as the Administrative Manager with the Voisey’s Bay Environmental Management Board, a multi-stakeholder environmental co-management board made up of Indigenous groups and the Federal and Provincial governments. 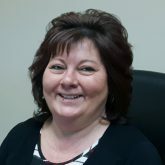 Roxanne holds a diploma in Secretarial Science from the Labrador Community College, Happy Valley-Goose Bay.